The Archbishop of Canterbury has boldly gone where other other religious leaders fear to tread, and politicians daren’t hardly ever go. Cutting straight across the liturgical denials of those who preach that terrorists who blow themselves up crying ‘Allahu Akbar!’ are “not Muslims“; and those who believe that slicing people’s throats on London Bridge shouting ‘This is for Allah!’ is “nothing to do with Islam“, Justin Welby has sounded a trumpet from his holy mountain. “There is a theology… and we need to counter that within our own tradition, and to stand up and say why it’s not acceptable… I think one of the problems in this country is a very high level of lack of religious literacy by those who have to take responsibility for countering these things… They often don’t understand the very basic doctrines of the faith they’re dealing with… They’re often people who are unable to put themselves in the shoes of religious believers and understand a way of looking at the world that says that this defines your whole life, every single aspect of who you are and what you are. “..how can we expect to respond effectively to religiously-motivated violence across our continent if we don’t have the ability to understand it? “..If we treat religiously-motivated violence solely as a security issue, or a political issue, then it will be incredibly difficult – probably impossible – to overcome it. A theological voice needs to be part of the response, and we should not be bashful in offering that. 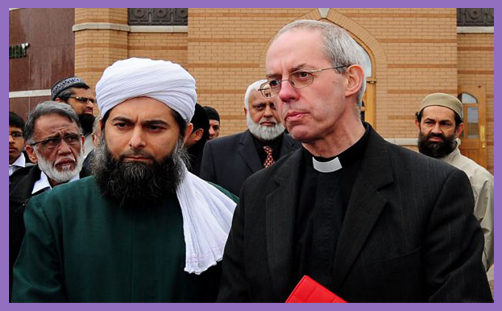 No doubt today and tomorrow and next week and next year Justin Welby will be derided for denigrating the great faith of Islam and for singling out Muslims for special disapprobation. But this would be a purposeful distortion of his mind and an abuse of his heart. This is not about attacking Muslims – the vast majority of whom are manifestly peace-loving and law-abiding – but challenging Muslim leaders to respond robustly and theologically with what is done in the name of their faith. It is wholly inadequate for the Dean of Southwark the Very Rev’d Andrew Nunn to go on BBC Radio 4’s World at One (@58.00) and proclaim Islamic heroism and beauty: “In my reading of the Qur’an and of the various teachings in the Muslim faith, none of this (violence) is part of what is proclaimed there,” he said. “It’s a complete aberration of what Muslims stand for.” Well, clearly not all of them. This woeful hermeneutic and Ladybird-Book scholarship aids no-one’s understanding of anything. The Dean of Southwark (along with all our religious and political leaders) must apprehend and understand what the Archbishop of Canterbury calls “the dark side” of Islam if it is to be dealt with effectively: ISIS is undeniably religiously and theologically motivated; Islamism is everything to do with Islam. But understanding cannot come without the educational assistance and expository acknowledgement of Muslim leaders. It is simply not enough for representative Islamic groups to issue pious condolences and ritual platitudes of outrage and condemnation in the wake of every proclaimed Islamist martyrdom: the next post-atrocity statement from the Muslim Council of Britain (which appears to be the self-appointed body representing British Muslims) must correct and rebuke the Islamists with quranic injunction and hadithic exposition. Then let the Prophetology-Christology debate begin, and then let us weigh the teachings of Mohammed with those of Jesus Christ, and do so boldly with faith, compassion and love. How then shall they call on him in whom they have not believed? and how shall they believe in him of whom they have not heard? and how shall they hear without a preacher? (Rom 10:14).